M67 fragmentation grenade, a hand grenade developed in the USA. A hand grenade is any small bomb that can be thrown by hand. A variety of types of hand grenades exist, the most common being explosive grenades designed to detonate after impact or after a set amount of time. Grenadiers were originally soldiers who specialized in throwing grenades. The word "grenade" derives from the French word for a "small explosive shell". Its first usage in English dates from the 1590s. It is likely derived from Old French pomegranate (influenced by Spanish granada), so called because the many-seeded fruit suggested the powder-filled, fragmenting bomb, or from similarity of shape. Anti-personnel fragmentation grenades are weapons that are designed to disperse lethal fragments upon detonation. The body is generally made of a hard synthetic material or steel, which will provide some fragmentation as shards and splinters, though in modern grenades a pre-formed fragmentation matrix is often used. The pre-formed fragmentation may be spherical, cuboid, wire or notched wire. Most AP grenades are designed to detonate either after a time delay or on impact. Anti-personnel fragmentation grenades can be divided into two main types, defensive and offensive, where the former are designed to be used from a position of cover, (e.g. in a slit trench or behind a suitable wall,) and have an effective radius greater than the distance it can be thrown, while the latter are for assaulting troops and have a smaller effective fragmentation radius. Modern fragmentation grenades such as the United States M67 grenade have a wounding radius of 15 m (half that of older style grenades, which can still be encountered) and can be thrown about 40 m. Fragments may travel more than 200 m.
These grenades are usually classed as offensive weapons, because the small effective casualty radius is much less than the distance it can be thrown. The concussion effect, rather than any expelled fragments, is the effective killer. In the case of the US Mk3A2, the casualty radius is published as 2 meters (6–7 feet) in open areas, but fragments and bits of fuse may be projected as far as 200 meters from the detonation point. In addition to on-land use, they have been used as an anti-personnel depth charge around watercraft—and some, such as the US Mk 40 concussion grenade, are specifically designed for use against enemy divers and frogmen. The Mk 40 kills or otherwise incapacitates the target by creating a lethal shockwave underwater. A range of hand-thrown grenades have been designed for use against armoured vehicles. An early, fairly weak example was the British Sticky bomb of 1940. Following designs such as the German Panzerwurfmine (L) and the Russian RPG-43, RPG-40, RPG-6 and RKG-3 series of grenades all used a HEAT warhead on one end and some method to stabilize flight and increase the likelihood of the 90 degree hit necessary for the shaped charge to be effective. Due to improvements in modern tank armor, anti-tank hand grenades are generally considered obsolete. However, in the recent Iraq War, RKG-3 anti-tank hand grenades were successfully used against lightly armored U.S. Humvees, Strykers and MRAPs leading to countermeasures such the fitting of "slat" armor or "bird cage" armor to cause any antitank grenade to detonate early. A stun grenade, also known as a flash grenade or a flashbang, is a non-lethal weapon. The first devices like this were created in the 1960s at the order of the British Special Air Service as an incapacitant. It is designed to produce a blinding flash of light and loud noise without causing permanent injury. The flash produced momentarily activates all light sensitive cells in the eye, making vision impossible for approximately five seconds, until the eye restores itself to its normal, unstimulated state. The loud blast causes temporary loss of hearing, and also disturbs the fluid in the ear, causing loss of balance. These grenades are designed to temporarily neutralize the combat effectiveness of enemies by disorienting their senses. When detonated, the fuse/grenade body assembly remains intact. The body is a tube with holes along the sides that emit the light and sound of the explosion. The explosion does not cause shrapnel injury, but can still burn. The concussive blast of the detonation can injure and the heat created can ignite flammable materials such as fuel. The fires that occurred during the Iranian Embassy Siege in London were caused by stun grenades. The filler consists of about 4.5 grams of a pyrotechnic metal-oxidant mix of magnesium or aluminium and an oxidizer such as ammonium perchlorate or potassium perchlorate. Sting grenades (also called rubber ball grenades or hornet's nest grenades) are based on the design of the fragmentation grenade. But instead of using a metal casing to produce shrapnel, they are made from two spheres of hard rubber. The smaller, inner sphere houses the explosive charge, primer, and detonator, and the outer sphere is the grenade casing. The space between the two spheres is filled with many small, hard rubber balls. Upon detonation the rubber balls explode outward in all directions, each one capable of inflicting a painful stinging impact. The balls bounce off hard surfaces so can appear to come from all sides, and can thus be likened to a swarm of hornets. Any people in the way will receive a series of fast, painful stings. The subject is forced to take cover from the blunt force of the projectiles. Some types have an additional payload of chemical agents like CS gas. The subject does not need to be looking at the grenade for it to take full effect in outdoor areas. Sting grenades are much more likely to cause a subject to either fall or lower themselves in pain, thus providing good sight lines to unaffected targets in the area. This makes sting grenades ideal for containing small groups of rowdy prisoners, providing a shooting opportunity when a suspect is hiding behind cover, or in allowing SWAT teams to clear small rooms. Sting grenades are sometimes called "stinger grenades," which is a genericized trademark as "Stinger" is trademarked by Defense Technology for its own line of sting grenades. A more recent development is the blank-firing impact grenade (BFIG). Preferred in many situations, especially training, for two main reasons; they are re-usable, and therefore more economical, because the charge is a standard ammunition blank, and they are subject to very few transport restrictions when unloaded. The BFIG contains a mechanism to fire a blank cartridge when dropped at any angle onto a hard surface from a height of a metre or more. Firing will occur in any combination of positions only on impact. Chemical and gas grenades include smoke grenades and incendiary grenades. Unlike explosive grenades, chemical and gas grenades are designed to burn or to release a gas, not to explode. Smoke grenades are used as ground-to-ground or ground-to-air signalling devices, target or landing zone marking devices, and screening devices for unit movement. The body is a sheet-steel cylinder with emission holes in the top and bottom. These allow the smoke to be released when the grenade is ignited. Two main types exist: coloured smoke (for signaling) and screening smoke. In coloured smoke grenades, the filler consists of 250 to 350 grams of coloured smoke mixture (mostly potassium chlorate, lactose and a dye). Screening smoke grenades usually contain HC (hexachloroethane/zinc) smoke mixture or TA (terephthalic acid) smoke mixture. HC smoke is harmful to breathe, since it contains hydrochloric acid. Whilst not intended as a primary effect, these grenades can generate enough heat to scald or burn unprotected skin, and the spent casing should not be touched until it has cooled. Tear gas grenades are similar to smoke grenades in terms of shape and operation. In tear gas grenades the filler is generally 80 to 120 grams of CS gas combined with a pyrotechnic composition which burns to generate an aerosol of CS-laden smoke. This causes extreme irritation to the eyes and, if inhaled, to the nose and throat. (See also the Waco Siege). Occasionally CR gas is used instead of CS. Incendiary grenades (or thermite grenades) produce intense heat by means of a chemical reaction. Greek Fire could be considered the earliest form of an incendiary grenade, which could be lit on fire and thrown in breakable pottery. The weapon was first used by the Byzantines. Modern incendiary grenades (or thermite grenades) produce intense heat by means of a chemical reaction. The body is practically the same as that of a smoke grenade. The filler is 600 to 800 grams of thermate, which is an improved version of World War II-era thermite. The chemical reaction that produces the heat is called a thermite reaction. In this reaction, powdered aluminium metal and iron oxide react to produce a stream of molten iron and aluminium oxide. This reaction produces a tremendous amount of heat, burning at 2,200 °C (3,992 °F). This makes incendiary grenades useful for destroying weapons caches, artillery, and vehicles. Other advantages include its ability to function without an external oxygen source, allowing it to burn underwater. Because they are not intended to be thrown, thermite incendiary grenades generally have a shorter delay fuse than other grenades (e.g. two seconds). White phosphorus (also used in smoke grenades; see above) can also be used as an incendiary agent. It burns at a temperature of 2,800 °C (5,070 °F). White phosphorus was notably used in the No 76 Special Incendiary Grenade by the British Home Guard during World War II. Thermite and white phosphorus cause some of the worst and most painful burn injuries because they burn so quickly and at such a high temperature. In addition, white phosphorus is very poisonous: a dose of 50-100 milligrams is lethal to the average human. The Molotov cocktail is an improvised incendiary grenade prepared from a glass bottle filled with gasoline (petrol) ignited by an attached burning strip of cloth when the thrown bottle bursts against its target. The Molotov cocktail received its name during the Soviet invasion of Finland in 1939 Winter War, but had been in use earlier in the decade when used by Franco's troops during the Spanish Civil War. The name originated from Finnish troops during the Winter War. It was named after former Soviet foreign minister Vyacheslav Molotov whom they deemed responsible for the war, and a humorous reference to the Soviet bombs known as "Molotov bread baskets" in Finland. The first incendiary grenades appeared in the Eastern Roman (Byzantine) Empire, not long after the reign of Leo III (717-741). Byzantine soldiers learned that Greek fire, a Byzantine invention of the previous century, could not only be thrown by flamethrowers at the enemy, but also in stone and ceramic jars. Later, glass containers were employed. Byzantine hand grenades with Greek fire in the 10th to 12th centuries are on display in the National Museum at Athens. The use of Greek fire, or rather variants thereof, spread to Muslim armies in the Near East, from where it reached China by the 10th century. In China during the Song Dynasty (960–1279AD), weapons known as Zhen Tian Lei (震天雷, "Sky-shaking Thunder") were created when Chinese soldiers packed gunpowder into ceramic or metal containers. In 1044, a military book Wujing Zongyao ("Compilation of Military Classics") described various gunpowder recipes in which one can find, according to Joseph Needham, the prototype of the modern hand grenade. This text of the Huolongjing was also important for the understanding of the Chinese hand grenade in the 14th century, as it provided much more detailed descriptions and even printed illustrations of the grenade bombs used. Production of Sidolówka hand grenades in an underground Armia Krajowa facility in Lwów during World War II. In 1643, it is possible that "Grenados" were thrown amongst the Welsh at Holt Bridge during the English Civil War. The word "grenade" originated in the Glorious Revolution (1688), where cricket ball-sized iron spheres packed with gunpowder and fitted with slow-burning wicks were first used against the Jacobites in the battles of Killiecrankie and Glen Shiel. These grenades were not very effective (probably because a direct hit would be necessary for the grenade to have effect) and, as a result, saw little use. 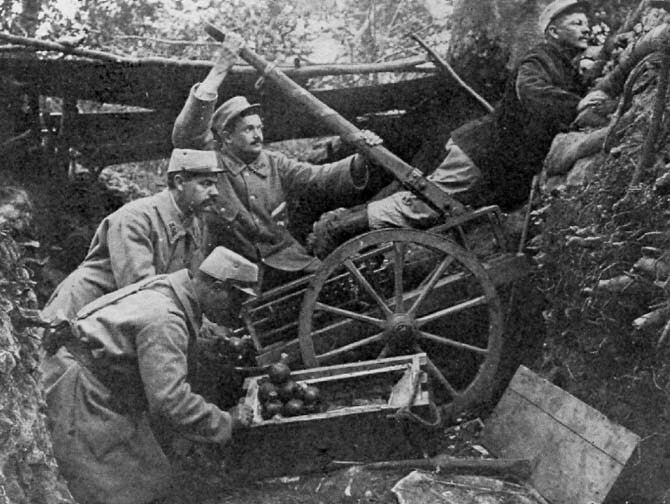 French troops using a catapult to throw hand grenades during World War I. The modern hand grenade was patented by Sergeant, First lieutenant and Officer Nils Waltersen Aasen in 1906 in Norway. In 1916 he was appointed a Knight of the French Legion of honor for the invention. He began his experiments with developing a grenade while serving as a sergeant in the Oscarsborg Fortress. The work was encouraged by the commandant of Oscarsborg, former Defence Minister Georg Stang, who was eager for strengthening and modernization of the armed forces with a view to a possible future conflict with Sweden. Aasen formed the Aasenske Granatkompani in Denmark which before the First World War produced and exported hand grenade in large numbers across Europe. In the American Civil War, both sides used hand grenades equipped with a plunger that detonated the device upon impact. The North relied on experimental Ketchum Grenades, with a tail to ensure the nose would strike the target and start the fuse. The Confederacy used spherical hand grenades that weighed about six pounds, sometimes with a paper fuse. They also used Rains and Adams grenades, which were similar to the Ketchum in appearance and mechanism. One of the first widely used percussion hand grenades was designed about 1903 by a colonel of the Serbian army, Miloš Vasić. In 1912, Colonel Vasić further redesigned his hand grenade into "Vasić" M.12 model. They were adopted by the Serbian army in 1912, just in time to be used in the 1st and 2nd Balkan War (1912–1913) and extensively used by Serbian infantry in World War I. That grenade was popular under name of "Vasićka" (by its designers name), or "Kragujevka" (by its place of manufacture, the military-technical works in Kragujevac, Serbia). The Vasić design was further developed into a series of new hand grenades that lasted until far after the end of World War II. The most infamous employment of the "Vasić" hand grenade occurred not long before the assassination of Archduke Franz Ferdinand in Sarajevo in 1914, when a conspirator threw one at the Archduke's car. The grenade bounced off and exploded under a following vehicle, wounding about 20 people. Franz Ferdinand and his wife were shot to death by another conspirator later that day. Austro-Hungarian authorities confiscated a couple of "Vasić" grenades from would-be assassins, using them to support accusations that Serbia was a participant in the murderous plot—the act that led to the outbreak of WWI. Early in World War I, both sides only had small grenades of a pre-war design. For example, in Italy, the Besozzi grenade had a five-second fuse with a match-tip that was ignited by striking on a ring on the soldier's hand. As an interim measure, the troops often improvised their own, such as the Jam Tin Grenade. These were replaced when manufactured versions such as the Mills bomb, the first modern fragmentation grenade, became available to British front-line troops. William Mills, a hand grenade designer from Sunderland, patented, developed and manufactured the "Mills bomb" at the Mills Munition Factory in Birmingham, England, in 1915 and designated the No.5. It was described as the first "safe grenade." Approximately 75,000,000 grenades were made during World War I. They were explosive-filled steel canisters with a triggering pin and a distinctive deeply notched surface. This segmentation was thought to aid fragmentation and increase the grenade's deadliness. Later research showed that the segmentation did not improve fragmentation. Improved-fragmentation designs would later be made with the notches on the inside, but at the time, this would have been too expensive to produce. The external segmentation of the original Mills bomb was retained, since it did provide a positive grip surface. This basic "pin-and-pineapple" design is still used in some modern grenades. On the other hand, the U.S. M67 fragmentation grenade has a smooth exterior, which is more suitable for being rolled or for throwing in a flat arc.The Mills bomb underwent numerous modifications. The No. 23 was a variant of the No. 5 with a rodded base plug which allowed it to be fired from a rifle. This concept evolved further with the No. 36, a variant with a detachable base plate to allow use with a rifle discharger cup. The final variation of the Mills bomb, the No. 36M, was specially designed and waterproofed with shellac for use initially in the hot climate of Mesopotamia in 1917, but remained in production for many years. By 1918 the No. 5 and No. 23 were declared obsolete and the No. 36 (but not the 36M) followed in 1932. The Mills was a classic design; a grooved cast iron "pineapple" with a central striker held by a close hand lever and secured with a pin. According to Mills' notes the casing was grooved to make it easier to grip and not as an aid to fragmentation, and in practice it has been demonstrated that it does not shatter along the segmented lines. The Mills was a defensive grenade: after throwing the user had to take cover immediately. A competent thrower could manage 15 metres (49 feet) with reasonable accuracy, but the grenade could throw lethal fragments farther than this. The British Home Guard were instructed that throwing range of the No. 36 was about 30 yards with a danger area of about 100 yds. At first the grenade was fitted with a seven-second fuse, but during combat in the Battle of France in 1940 this delay proved too long—giving defenders time to escape the explosion, or even to throw the grenade back—and was reduced to four seconds. The German Model 24 Stielhandgranate stick grenade was introduced in 1915 and the design developed throughout World War I. A friction igniter was used; this method was uncommon in other countries but widely used for German grenades. A pull cord ran down the hollow handle from the detonator within the explosive head, terminating in a porcelain ball held in place by a detachable base closing cap. To use the grenade, the base cap was unscrewed, permitting the ball and cord to fall out. Pulling the cord dragged a roughened steel rod through the igniter causing it to flare-up and start the five-second fuse burning. This simple design continued to evolve throughout the First and Second World Wars, with the Model 24 grenade (popularly known as the "potato masher") becoming one of the most easily recognized of all small arms, and synonymous with the German soldier. During World War II, the United Kingdom used incendiary grenades based on white phosphorus. One model, the No. 76 Special Incendiary Grenade, was mainly issued to the Home Guard as an anti-tank weapon. It was produced in vast numbers; by August 1941 well over 6,000,000 had been manufactured. The grenade could either be thrown by hand, or fired from the Northover projector, a simple mortar; a stronger container was needed for the latter and the two types were colour-coded. As any breakage of the flask would be dangerous, storage under water was recommended. Examples of grenades fitted with impact fuses are the German M1913 and M1915 Diskushandgranate, and any British grenade fitted with the Allways fuse such as the No 69 grenade, No 77 grenade and No 82 grenade (Gammon bomb). In a timed fuse grenade, the fuse is ignited upon release of the safety lever. 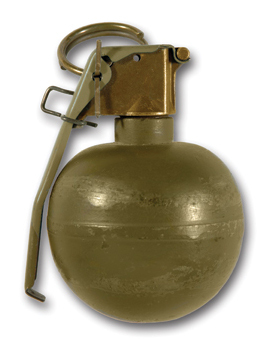 Timed fuse grenades are generally preferred to hand-thrown percussion grenades because their fusing mechanisms are safer and more robust than those used in percussion grenades. A classic hand grenade has a safety handle or lever (known in the US forces as the spoon) and a removable safety pin that prevents the handle from being released. Some grenade types also have a safety clip to further prevent the handle from coming off in transit. To use a grenade, the soldier grips it with the throwing hand, ensuring that his thumb holds the safety lever in place. Left-handed soldiers are advised to invert the grenade, so the thumb is still the digit that holds the safety lever. The soldier then grabs the safety pin's pull ring with the index or middle finger of the other hand and removes it. He then throws the grenade towards the target. Soldiers are trained to throw grenades in standing, prone-to-standing, kneeling, prone-to-kneeling, and alternate prone positions and in under- or side-arm throws. If the grenade is thrown from a standing position the thrower must then immediately seek cover or lie prone if no cover is nearby. Once the soldier throws the grenade, the safety lever releases, the striker throws the safety lever away from the grenade body as it rotates to detonate the primer. The primer explodes and ignites the fuse (sometimes called the delay element). The fuse burns down to the detonator, which explodes the main charge. When using an antipersonnel grenade, the objective is to have the grenade explode so that the target is within its effective radius. The M67 frag grenade has an advertised effective kill zone of five meter radius, while the casualty-inducing radius is approximately fifteen meters. Within this range, people are generally injured badly enough to effectively render them harmless. However, these ranges only indicate the area where a target is virtually certain to be incapacitated; individual fragments can still cause injuries as far as 230 meters away. Cooking is a term referring to intentionally holding onto an armed grenade after the pin has been pulled and the handle released; allowing the fuse to burn partially to decrease the time to detonation after throwing. This technique is used to reduce the ability of the enemy to take cover or throw the grenade back. It is also used to allow the grenade to burst in the air over defensive positions. This technique is inherently dangerous, since fuses may vary from grenade to grenade. Because of this the U.S. Marines (MCWP 3-35) describe cooking as the "least preferred technique," recommending a "hard throw, skip/bounce technique" to prevent an enemy returning a grenade. A call is usually given upon deploying a grenade, to warn friendly forces. Some yells, such as frag out or fire in the hole, signal that a grenade has been deployed. In any instance the purpose is to warn fellow soldiers to take cover. In the U.S.M.C. when a grenade is dropped into an enclosed space like a tunnel, room, or trench, the person dropping the grenade yells fire in the hole to warn that an explosion is about to occur. U.S. military procedure includes calling frag out to indicate that a fragmentation grenade has been deployed. Grenades have often used in the field to construct booby traps, using some action of the intended target (such as opening a door, or starting a car) to trigger the grenade. These grenade-based booby traps are simple to construct in the field as long as instant fuzes are available, a delay in detonation can allow the intended target to take cover. The most basic technique involves wedging a grenade in a tight spot so the safety lever does not leave the grenade when the pin is pulled. A string is then tied from the head assembly to another stationary object. When a soldier steps on the string, the grenade is pulled out of the narrow passageway, the safety lever is released, and the grenade detonates. Abandoned booby traps and discarded grenades contribute to the problem of UXO. The use of target triggered grenades and AP mines is banned to the signatories of the Ottawa Treaty and may be treated as a war crime wherever it is ratified. Many countries including India, the People's Republic of China, Russia, and the United States have not signed the treaty citing self-defense needs. Some grenades are designed to be thrown longer distances. The German "potato-masher" grenade had a long wooden handle that extended its range by fifty percent. The potato-masher was fired by a friction igniter in the head, activated by a pull string threaded through the hollow handle. Immediately before throwing the grenade, the soldier pulled a small porcelain ball at the end of a string attached to the friction igniter. This started the time fuse, which fired the detonator after a delay. The potato-masher is often incorrectly thought to have had an impact fuse. It did not, but the superficially similar British stick grenade design of 1908 did. Stylized pictures of early grenades, emitting a flame, are used as ornaments on military uniforms, particularly in Britain, France (esp. French Gendarmerie and the French Army), and Italy (Carabinieri). Fusilier regiments in the British and Commonwealth tradition (e.g., the Princess Louise Fusiliers, Canadian Army) wear a cap-badge depicting flaming grenade, reflecting their historic use of grenades in the assault. The British Grenadier Guards took their name and cap badge of a burning grenade from repelling an attack of French Grenadiers at Waterloo. The Spanish artillery arm uses a flaming grenade as its badge. The flag of the Russian Ground Forces also bears a flaming grenade device. The branch insignia of the U.S. Army Ordnance Corps also uses this symbol, the grenade being symbolic of explosive ordnance in general. The United States Marine Corps also uses the grenade on their uniforms: the rank insignia for master gunnery sergeant has three chevrons pointing up, with four rockers on the bottom. In the middle of this is a bursting bomb, or grenade. U.S. Navy Aviation Ordnanceman's rating badge features a winged device of similar design. Ukrainian mechanized infantry and engineers use a flaming grenade in their branch insignia. The Finnish Army Corps of Engineers' emblem consists of a stick hand grenade (symbolizing demolition) and a shovel (symbolizing construction) in saltire. ↑ 2.0 2.1 "Grenade". Encyclopædia Britannica. ↑ Dockery 1997, p. 188. ↑ "Impact Stun Grenade from HFM Pyrotechnics:". Hfmgroup.com. http://www.hfmgroup.com/professionalsupplies/product-specs/impact-grenade.html. Retrieved 2008-12-26. ↑ Harold Miles Tanner (30 March 2009). China: A History. Hackett Publishing. p. 204. ISBN 978-0-87220-915-2. http://books.google.com/books?id=VIWC9wCX2c8C&pg=PA204. "First known illustration of a fire lance and a grenade"
↑ Derk Bodde (1987). Chinese Ideas About Nature and Society: Studies in Honour of Derk Bodde. Hong Kong University Press. p. 300. ISBN 978-962-209-188-7. http://books.google.com/books?id=aPQuETESw84C&pg=PA300. Retrieved 15 February 2013. ↑ Needham, Volume 5, Part 7, 179. ↑ Needham, Volume 5, Part 7, 179-180. ↑ Cramb, Auslan (23 Feb 2004). "Battlefield gives up 1689 hand grenade". http://www.telegraph.co.uk/news/main.jhtml?xml=/news/2004/02/23/ngren23.xml&sSheet=/news/2004/02/23/ixhome.html. ↑ "The National Archives, records of the UK government". Letters of Hibbert, Hugh Robert, 1828-1895, Colonel, ref. DHB/57 - date: 14 June 1855. http://www.a2a.org.uk/search/records.asp?cat=017-dhb&cid=3-1-3#3-1-3. Retrieved 2006-08-09. ↑ LEXPEV. "Yugoslavian hand- and riflegrenades". Lexpev.nl. Archived from the original on 2008-08-04. http://web.archive.org/web/20080804042526/http://www.lexpev.nl/grenades/sovietbalkan/yugoslavia/index.html. Retrieved 2008-12-26.